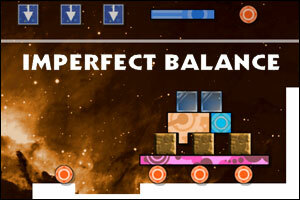 Imperfect Balance is a spin-off of Perfect Balance and Perfect Balance 2, two popular physics-based puzzle games created by Ville Helin and Jyri Luukkonen from ttursas. Unlike in its two predecessors, your goal here is to make towers fall, constructions collapse and shapes explode! To do so, use your mouse to pick up and drop shapes. use your mouse wheel (or [A], [D] or the left and right arrows to rotates the shape. Try to make all the colorful blocks fall off the screen for a perfect score! Imperfect Balance contains achievements, bonus level packs and a playable the end screen. The game features a total of 60 levels of increasing difficulty: that should be enough to keep you busy for a while! I passed level 3 but it will not allow me to go to level 4? What’s up with that? You mean level 4 is not unlocked in the bottom menu? I’m guessing the problem is you don’t have enough diamonds. Replay some other levels and try to clear all the shapes instead of just how many are required. If that’s not the problem I’m not sure what to tell you, but good luck getting it fixed! I’ve just updated the game: it should work fine now! Thank you Eric, but I believe that wiped our progress. But it should be the last update, so you are probably good to go! For the Video walkthrough of X-3, it did not show how to get the last crystal..anyone know how to complete it all the way..?? I’m left with X-3 as well. Got the blue piece to bounce off once but some other block didn’t fall that time. I haven’t been able to reproduce it after trying for hours. Posted on Sunday, March 21st, 2010. Follow any responses through the RSS 2.0 feed.